From the inception of this public website, we imagined that it would have a companion forum for the exchange of ideas among persons with a professional interest in U.S. strategy and foreign policy. We call that companion MESHNet. 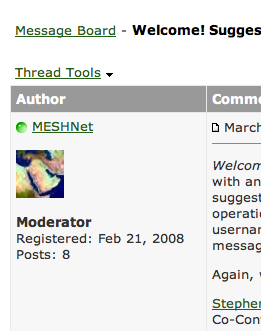 MESHNet is a members-only message board, ideal for hosting open and structured discussions. We plan to develop MESHNet as a place where established and budding experts can express views among their peers, and where we can quickly congregate to enlighten and update one another during the crises that inevitably punctuate the affairs of the Middle East. MESHNet will be launched next Tuesday, April 1. If you think you might qualify for membership, we urge you to apply. Read more about MESHNet here, and apply here.